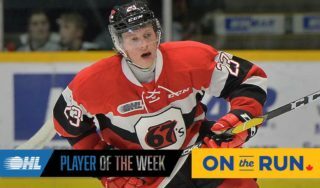 Ottawa’s top scorer is an offensive threat in every match, his 65 points has him ranked in the OHL’s top ten. He’s hot right now, currently riding a nine-game point streak that’s seen him score seven goals and eight assists. When he last faced the Battalion, Salituro tallied three helpers, so look for him to chip in again tonight art TD Place. The Russian goaltender enjoyed a stellar January, posting a record of 6-2 with a 2.35 goals against average and a .920 save percentage. He rattled off four victories in row before dropping last Friday night’s game 5-2 to the Hamilton Bulldogs. Look for him to rebound tonight against North Bay this evening. The big Belarusian blueliner had struggled before Saturday’s 3-0 win in Peterborough. In the five previous games, Stepan only recorded one assist and was a minus six. 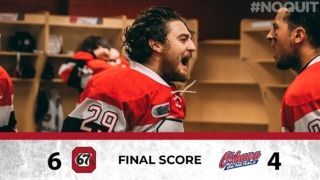 Here’s hoping his night against the Petes was a sign of things to come, as he scored the game winner and added an assist in the very important divisional victory. In his fourth season with the Battalion, Santos has improved by leaps and bounds. After only posting 29 points in 67 games last year, Mathew is on pace to more than double that. He currently has 47 in 45 contests and should play 19 more before season’s end. Look for him on the Battalion’s top line tonight at TD Place. North Bay’s leading scorer is just three points up on Ottawa’s Dante Salituro for eighth spot among the OHL’s top point producers. His 68 points in 49 games is a career high for the Sault Ste. Marie native, who has improved his point total every year in the league. The Battalion’s number one centre will be heavily involved in both ends of the ice tonight versus the Barber Poles. The rookie OHLer has been a standout for North Bay this season. He ranks second in scoring among OHL defencemen with 11 goals and 34 assists in 48 games. He was recently named the league’s top rookie for the month of January, his second Rookie of the Month honour this season. Look for him to quarterback the Battalion’s power play tonight at TD Place. The 67’s are also offering a skate check for those fans who’d like to skate down the Rideau Canal to get to tonight’s game. Can’t make it down to TD Place? 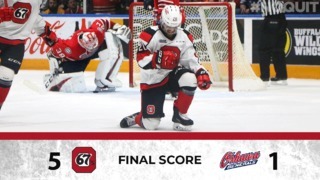 Catch the 67’s live on Rogers TV Ottawa (Cable 22) or listen to this afternoon’s game on TSN 1200. 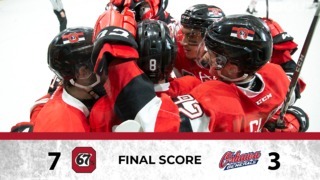 The 67’s Family Day game is set for Monday, February 15 at 2 p.m. for a rematch with the North Bay Battalion. After the game, all kids are invited to hit the ice with the team and grab autographs from your favourite players. So make sure you come early and stay late.